The hubby and I used to go to the Chicago Rock Bottom all the time, pretty much every time we were downtown. It was the first brewery we went to in Chicago. It was the first mug club I ever joined and I have an embarrassingly large amount of Rock Bottom swag (my favorite of which is my growler cozy) from accumulating so many visits. I knew of brewmaster Pete Crowley and was a huge fan of his beers. But when Mr. Crowley moved on to open Haymarket Pub and Brewery, the hubby and I followed him there and haven’t gone back to Rock Bottom since. Well, I found myself downtown on Friday and thought I would stop by and see what brewmaster Chris Rafferty is up to. I perused the beer list to check out the seasonals. There were quite a few that sounded interesting so I opted to get samples of the barrel-aged offering, the Winter Wheat, the Fallen Angel Abbey Ale, and the dry hopped stout. The barrel-aged beer currently available is an export stout aged in Woodford Reserve barrels. There was heavy carbonation which was a nice surprise; I was expecting a thick, syrupy beer. It had a light body and was very tasty with a beautiful aroma. It was especially good if you let it warm up a bit as much more of the bourbon comes through. 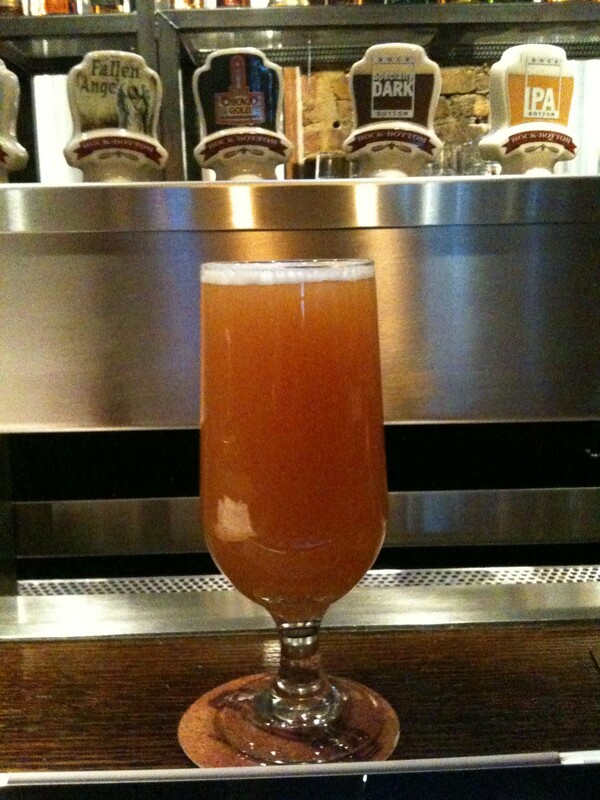 I then moved on to the Winter Wheat, a strong wheat beer brewed with coriander, orange peel, cinnamon, and mase. It poured a hazy orange and had a hint of orange on the nose. It reminded me of those Christmas oranges that are covered in cloves. The spices didn’t overpower the beer but rather accented it perfectly. I am not typically a wheat beer fan but this 8.5% ABV Winter Wheat was fantastic, and it was a really interesting take on a holiday beer. Well done! I next sampled Fallen Angel Abbey Ale, a Belgian Dubbel. It was a hazy amber hue with caramel and a slight Belgian yeast aroma. This was a little lighter in flavor than many abbey ales but I liked this; sometimes they can be a little too heavy. My only criticism is that it may be a tad over carbonated. The Dry Hopped Stout was brewed with one and a half pounds of Chinook hops but the server wasn’t sure which hop varietal was used in dry-hopping (he thought it was either Cascade or Amarillo). The aroma was a nice blend of hops and roast. The hops do not overpower the flavor; it is perfectly balanced with just a subtle earthiness contributed by the hops. It reminded me a little bit of Stone’s Sublimely Self Righteous Ale although not quite as hoppy. If they increased the hops a bit, this would be a great black IPA. After my little flight of beers, I ordered a full beer of the Winter Wheat. If I didn’t have plans that would require me to lug it around all over Chicago, I would have gotten a growler of this one. When I got my bill, I noticed that I was only charged for the full sized beer. When I brought this to the server’s attention, he said, “Oh, you were just tasting before.” REALLY??? He gave me full two-ounce samples of four limited-release beers and they were free??? AND, for being a mug club member, I got $5 off the entire bill. So, for those of you keeping track, I got a flight of beers, a full size beer, and lunch for $13. Not bad… (Just for the record, I tipped on the full amount.) I was really impressed with the beers at Rock Bottom Chicago and I am very excited to return to see what else Mr. Rafferty has in store for his beer loving public. 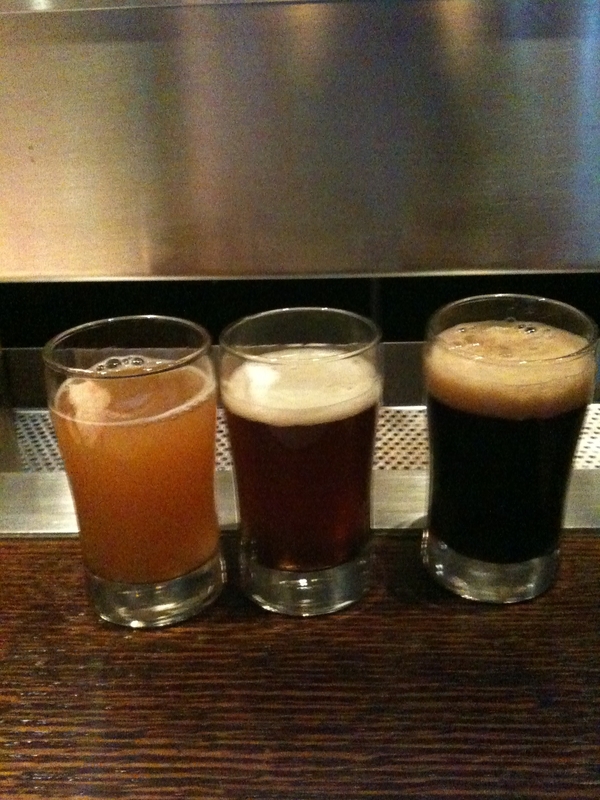 Next time you are downtown or are holiday shopping along Michigan Avenue, stop in for a beer. You won’t regret it.